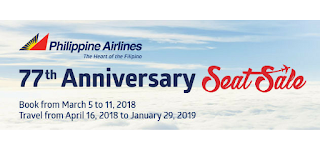 In celebration of Philippine Airlines' 77th Anniversary, they are offering fares as low as 77 pesos for domestic flights and big discounts for international flights. Travel period for the promo fares is from April 16, 2018, until January 29, 2019. All you need to do is go to their website and book a flight before March 11, 2017. Flights that cost 77 pesos only includes Clark to Bacolod, Clark to Cagayan de Oro, Clark to Davao, Clark to Virac, and Clark to Naga. 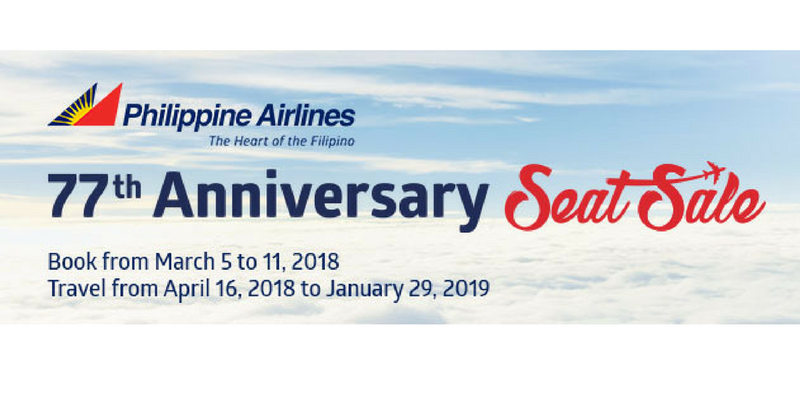 Cebu flights were also lucky to get 77 pesos fares that include Cebu to Davao, Cebu to General Santos, Cebu to Kalibo, Cebu to Legaspi, Cebu to Caticlan, Cebu to Ozamis, Cebu to Puerto Princesa and Davao to Zamboanga. For Manila flights, fares are discounted to 777 pesos one-way economy base fare for travel periods from May 1, 2018, to January 29, 2019. The fares quoted are exclusive of ticketing service charge of 250 pesos and government taxes and fees that cost between 10 pesos to 298 pesos. Each ticket comes with 7 kg hand-carried baggage and 20 kg checked in baggage. except for flights from and to Clark, Davao, and Cebu. For International flights, tickets start at 117 USD for a roundtrip economy all-in fare to Hong Kong. Meanwhile, Manila to Macau, Cebu to Bangkok, Manila to Kuala Lumpur only costs 97 USD for a roundtrip economy ticket. Premium economy and business class tickets are also on sale which starts at 337 USD for Manila to Hong Kong tickets. For business class, tickets from Manila to Hong Kong start at 437 USD. 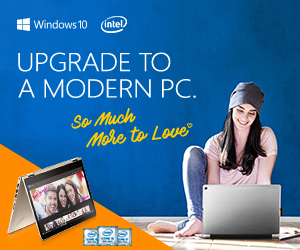 However, a minimum of 2 passengers that will be traveling together is required to avail the promo. For more information on domestic flight fares, visit this link. For international flights, check this link.